Helps relieve pain and spasm. The Original Orbit Massager® has a smooth, comfortable shape that allows you to give a stress releasing, relaxing massage to the back, neck, shoulders and to muscles throughout the body. You can use the Original Orbit Massager® on yourself or on someone you care about. The innovative, gliding action of its freely rotational ball kneads the muscles in the same way the professional massage therapist works to loosen and relax soft tissues and to encourage circulation. 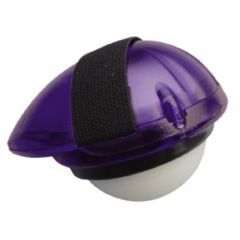 The orbit massager is comfortable and easy to use, and the custom made ball rolls easy on the body, making it a fantastic acupressure product. With it's small size, it is easily packed to use on vacations, traveling in the car, or anywhere you need a massage. The Orbit Massager is a multi-rotational, omni-directional massager device, which glides freely across the contours of the skin, in the natural rotational patterns used in traditional massage techniques.